Like a fingerprint, every tattoo is unique. That said, many tattoos share common design elements, including those using text. If your next tattoo is going to include text, consider these options. We’ve included a selection of traditional typestyles as well as several unconventional designs that will help your tattoo stand out. 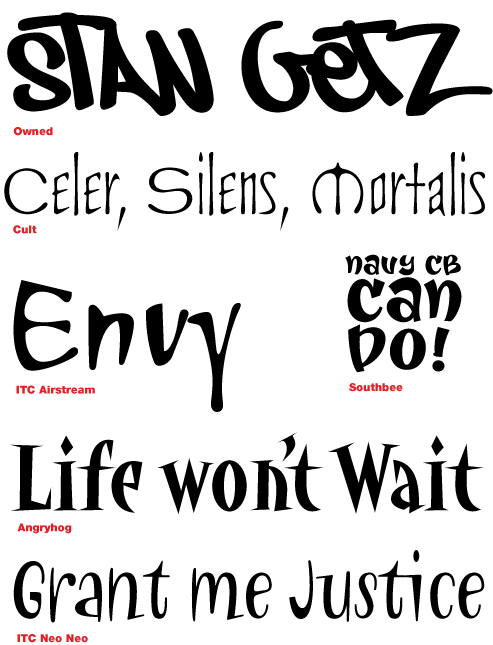 Browse these designs and others available from Fonts.com, then ask your tattoo artist for the font you want by name! Choose wisely. A typeface can impact a tattoo design as much as the color and placement. Script fonts can give a personalized touch to any tattoo. 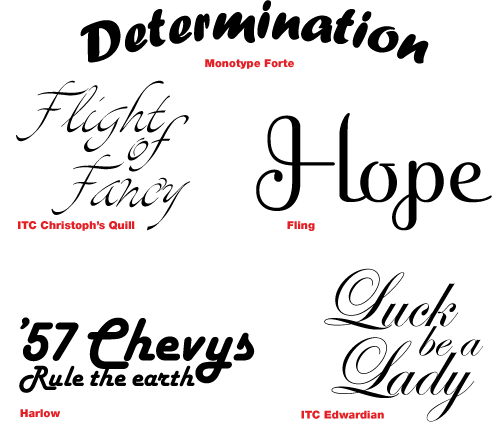 Fonts such as the ITC Edwardian™ and the ITC Christoph’s Quill™ designs can add formality to remembrance tattoos, while the the Forte™, Harlow™, or Fling™ fonts impart their own special emotion. Script typefaces are passionate communicators that will enhance your message. Blackletter fonts are similar to some medieval forms of manuscript lettering. Often referred to as "gothic", the most popular blackletter font - the Old English™ design - is a classic example. 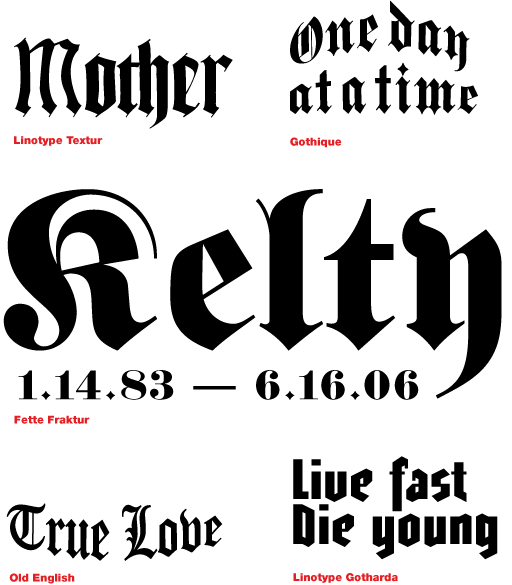 Other blackletter fonts include the Fette Fraktur™, Gothique™, Linotype Textur™ and Linotype Gotharda™ designs, all of which share a style that is unquestionably gothic while maintaining their own distinct aura. Celtic fonts, sometimes called "uncial” fonts, are a popular match with Celtic armband or Celtic tribal tattoos. Uncial letters were written from the late Roman Empire through the early Middle Ages, their rounded forms being quicker to write with a reed pen than the sharp-angled Roman capitals. Their calligraphic heritage has been given a modern twist in fonts such as the ITC Forkbeard™, Iona™, ITC Frances Uncial™, ITC Korigan™ and Sweeney™ designs. We've taken the best designs off the walls and made them available as fonts. Graffiti fonts have almost as wide a variety as graffiti writing does. The ITC Airstream™, ITC Neo Neo™, Cult™, Angryhog™, Owned™ and Southbee™ designs have that look anybody after a "street" tattoo will want. How brave are you? You want that new tattoo to be an original, why not choose a font that nobody else has the guts to use? 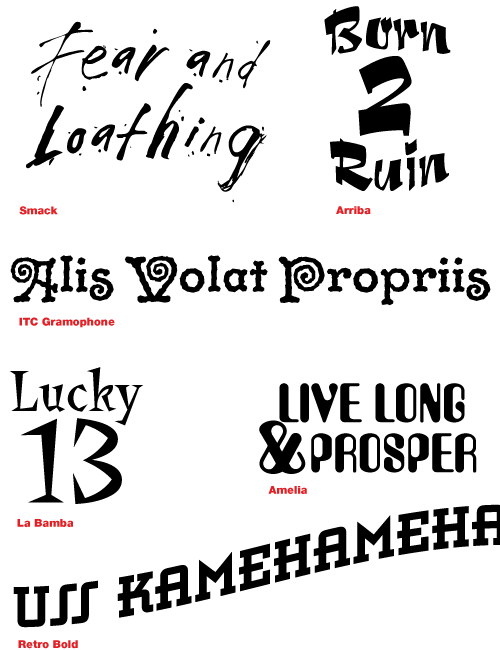 Look to the ITC Gramophone™, Arriba™, Amelia™, Smack, La Bamba or Retro fonts for a look that will get your new ink noticed. Your mom will hate it! Attention tattoo artists: We offer a wide variety of font packages that allow you to provide a variety of font choices to your customers, without breaking your budget.